My Tango Diaries: I'm in. Today I'm celebrating my first 4 months of tango. I have been to 23 milongas, 26 practicas and I don't-know-how-many weekly classes. Over 120 hours of tango - probably closer to 150 hours. Still, I know dancers who've clocked more time, more hours, more miles in the same period. At once it doesn't seem like it's been 4 months and yet my pre-tango days seem to get farther and farther behind me. I can't remember very clearly how I looked at my world before I saw it through the milonga's lens. I have sound and smell associations that I'd never dreamed would be so powerful. The smell of red wine. The sound of whispering shoes on wood floors. The bandeneon as it weeps, shouts in anger, breathes a sigh. The leader that hums softly in my ear. The teacher that whispered "wait". How many miles on the milonga floor so far? I'm still a tango baby. I still don't have tango shoes and my poor ballroom shoes have taken such a beating. I'm pinning and tucking my various skirts and blouses as I've lost weight dancing so much. There is no workout on the planet that feels like this. A trip to the gym has never left me buoyant and giddy and completely exhausted at the same time. And even more important than the above - the new people, new friends - and new world, that I am a part of now. I go to every milonga I can because there are different people in attendance at different venues and I want to see them all every week. I want to visit, chat, laugh, watch, admire, drink a little wine, giggle, make faces, cry, tell jokes, hug, kiss, comfort and be comforted. I get asked almost every week how I fell so far into tango in such a short period of time. How can I be this addicted, this obsessed? I don't know, though I can speculate. First, I'm a writer - and writers are always ready to jump in. But there's more. I fell because I was ready to fall. Never more ready in my life. I stood on the precipice and faced a choice - fall in or fall out. I couldn't walk the line and observe. Tango asked me, "are you in or are you out?" I'm in. All the way in. Pamela: I think tango does find us. 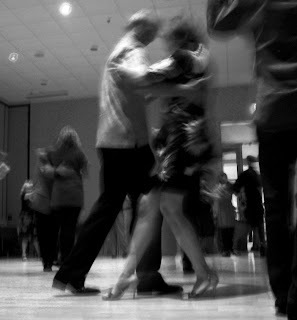 I'd been listening to tango music for years before I finally decided to learn to dance. So many things in my life and my world seemed to come together at one time - that it was just too compelling to ignore. A trusted friend, I had learned, was dancing tango - and then a free class at the university that I work - and then a chance viewing of The Tango Lesson - all of this within a week. I just told The Universe, alright already. I get it. I'll learn!